Hog Roast Birkenhead is what we call an exciting new way to cater the special occasions and events which bring families, organisations and the community together. 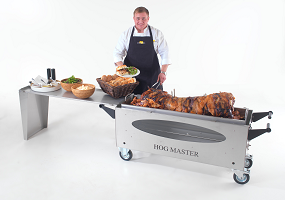 As a hog roast caterer, we bring the traditional, perfected craft of spit-roasting pigs and other meats to contemporary events, creating a unique blend of the old and new. We serve the Birkenhead area and cater for all events and occasions:- weddings, private parties, charity fundraisers, festivals and fairs, and corporate functions – big or small. In fact, we do not put any limit on the size of your party, in either direction, so you never have to change the vision of your event because of us. We think that, since it is after all your event, it only makes sense to let you have total control over how it turns out – especially as the catering often proves such a significant aspect of many events. That is why we put such emphasis on our customers’ ability to customise everything about the way we cater their events. Our service is permeated by this ethos, and it affects the way we go about everything. Our menus, unlike most caterers, are personalisable. We create bespoke menus for one-off events, which is absolutely perfect if you have a strong vision of what you want to have. So, if you have a specific dietary requirement to cater for, there is the option of creating a menu which includes dishes that conform to such diets – which will make all your guests feel included and thought of. Similarly, if your event – a wedding, for example – has a theme, then it is a perfect opportunity to be able to reflect that theme in your menu. All we ask is that our spit roasted meat is the main course – after all, it is our speciality, and we think it’s extra delicious – but even then, we have a large choice of meats to choose from, including spring lamb, whole chickens and turkeys, sirloin of beef, as well as all your barbecue favourites. And, again, if you have another meat in mind, we are sure to be able to source it for you, and incorporate it into your menu. We are also well-experienced at cooking to specific religious requirements, namely kosher and halal. As for what the rest of our menus consist of usually – well, our menus are representative of the latest trends and techniques seen in modern gourmet cuisine. Our talented chefs are well versed in whipping up innovative canapés, using well-sourced and exciting local and exotic ingredients. It is the fact we integrate the tradition of spit and hog roasting into a modern environment that makes Hog Roast Birkenhead unique. The flexibility of the hog roast; being able to fit it into the simplest of dishes (a pork roll) equally well as in an ornate three course meal means we here at Hog Roast Birkenhead can offer our customers a vast range of options to fit the often complicated and diverse modern event. Alongside our comprehensive catering service, we run an exciting service we call Hog Roast Hire Birkenhead. It’s a great way to sample our craft, as well as taking control of your event totally! We rent out our intuitive and custom-designed spit-roast machines to all-comers, providing an affordable way to take catering into your hands. Putting on a hog roast a private party or alternatively, at a special pub night or other entertainment venue can really give it the boost it needs. The sight of a hog roast is a great spectacle, and the most historic way humans gather together – around the warmth of their next meal. Renting one of our machines can also function as a great way to find out whether you would like to buy one outright, and starting your own hog roast operation. We even waive the price of your rental period if you go on to buy a machine. We firmly believe spit roasting is an excellent, universally appreciated way of cooking, and wish only to show more people this, through whatever means possible. That’s why our Hog Roast Hire Birkenhead service is so important to us. As you can see, we have many strings to our bow, and believe we have something to offer every type of occasion. We would recommend getting in touch with us now, if you are thinking of planning an event with us, firstly because it is best to book now before we become too busy, and secondly, because we work so closely with our customers. The more time we have to plan, the more special your event will be!